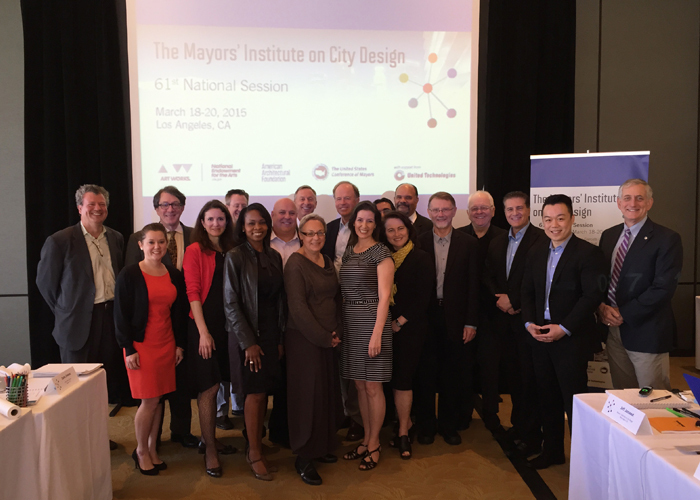 March 2015 – LOS ANGELES – The Mayors’ Institute on City Design (MICD) was held in Los Angeles, CA from March 18-20 for its 61st National Session. Hosted by Mayor Eric Garcetti and the City of Los Angeles, the event was attended by Columbia, MO Mayor Robert McDavid; Hialeah, FL Mayor Carlos Hernandez; Mesa, AZ Mayor John Giles; Oakland, CA Mayor Libby Schaaf; Portland, OR Mayor Charlie Hales; and San Antonio, TX Mayor Ivy Taylor. Experts in architecture, landscape architecture, urban planning, real estate development, transportation planning, public art, and urban design joined the mayors in the two-and-a-half-day discussions and offered pragmatic advice on how the mayors could approach the city design challenges facing each of their cities. The 61st National Session began with a tour of downtown Los Angeles led by the Mayor’s Office. The tour showcased major downtown sites, including Grand Central Market, Bradbury Building, the Broadway corridor, and the Arts District. Later that evening, the opening reception was held on the 27th floor observation deck at city hall, which features a panoramic view of Los Angeles skyline. Welcome remarks were made by the MICD Director Trinity Simons; National Endowment for the Arts Director of Design Programs Jason Schupbach; American Architectural Foundation President and CEO Ron Bogle, Hon. AIA; and the United States Conference of Mayors CEO and Executive Director Tom Cochran. Mayor Garcetti joined participants for dinner on the next day. Oakland Mayor Schaaf initiated the design discussions the following morning, presenting on the city’s efforts to redevelop the area south of Lake Merritt. Building on the success of Lake Merritt Boulevard, the city would like to improve neighborhood access and connectivity to new amenities around the lake. The Resource Team gave guidance on how to integrate the existing assets, including the Henry J. Kaiser Convention Center, BART Station, and Laney Community College into the redevelopment vision. Mesa Mayor Giles followed with a discussion on creating a more vibrant and lively downtown. With four light rail stations opening this year, the city anticipates development pressure and recognizes the opportunity to bring catalytic changes to Mesa. The Resource Team advised the mayor to target development on Main Street and provided examples of land use policy that can help manage city-owned parcels around downtown. San Antonio Mayor Taylor presented on the city’s efforts to enhance the Howard W. Peak Greenway Trails System, a network of planned recreation trails that wind through the natural landscapes along San Antonio creeks. With 46 miles of trails now open to the public and 40 additional miles funded, the city is seeking design strategies to provide better linkages to neighborhoods. The Resource Team encouraged the mayor to focus the planning efforts on one segment of the trails ring as a demonstration project, allowing it to expand and inspire the rest of the network. Portland Mayor Hales concluded Thursday’s discussions with a corridor development project on Martin Luther King Jr. Boulevard. The city would like to create an African-American cultural district that supports minority-owned businesses and promotes equitable development, using the corridor as the building blocks for the underrepresented communities in northeast Portland. The Resource Team offered suggestions on public policy, as well as creating landmarks that pay homage to the area’s history and residents. Hialeah Mayor Hernandez commenced the discussions on the final day with a presentation on the Tri-Rail and Metrorail Transfer Station. The city would like to maximize the redevelopment potential of the station area, leveraging transit to bolster economic development and catalyze neighborhood revitalization. The Resource Team advised the mayor to work with the community and potential institutional partners to develop a vision for the site and curate the experience that is authentic to Hialeah’s unique cultural identity. Columbia Mayor McDavid concluded the Institute with a discussion on housing for university students in the city. Prompted by rapid growth in student population, the city is looking for the appropriate strategies to meet the demand of new housing projects. Emphasizing the value of long-range planning and public engagement, the Resource Team weighed in on the underlying issue and helped the mayor identify key stakeholders. Joining the mayors at this National Session was a distinguished group of Resource Team members: U3 Advisors Co-CEO Omar Blaik; Charlier Associates President Jim Charlier, AICP; Dlandstudio Architecture + Landscape Architecture Principal Susannah Drake, AIA, FASLA; the City of New Orleans Place-Based Planning Director William Gilchrist, FAIA; Barbara Goldstein & Associates Principal Barbara Goldstein; Carlos Jiménez Studio Principal Carlos Jiménez; Brooks + Scarpa Architects Principal Lawrence Scarpa, FAIA; and the U.S. Department of Housing and Urban Development Office of Economic Resilience Director Harriet Tregoning. The Mayors’ Institute on City Design is a National Endowment for the Arts leadership initiative in partnership with the American Architectural Foundation and the United States Conference of Mayors. The 61st National Session was sponsored in part by United Technologies Corporation. Since 1986, MICD has helped transform communities through design by preparing mayors to be the chief urban designers of their cities. MICD conducts several sessions each year. For a list of upcoming events, past attendees, or for more information, visit micd.org and follow @MICDdotORG on Twitter.